Empowering, impressive, passionate, powerful and inspirational are a few words that have been used to describe Chris. As a motivational teacher, coach and mentor, his goal is to inspire and motivate you to master your mindset so you can be the best you can be. His clients include business owners and entrepreneurs along with individuals and companies in the areas of sales, human resources, relationship marketing, information technology and health & fitness. His life experience, knowledge, and passion for achievement allow him to create for you a compelling and empowering seminar or retreat and an engaging one-on-one and group coaching environment. Engage with Chris and you will have an event and an experience like no other. He brings passion and energy into the room with enthusiasm for and knowledge of the mind, leadership, effectively connecting with people, body language and other subjects key to helping you break through barriers and achieve your goals. Combining humor, stories and content to entertain and educate audiences, he will equip you with the tools necessary to master your mindset and drive lasting improvements that create greater success in today’s challenging environment. He speaks and listens from the heart and cares at a very deep level about people he connects with which allows him to add value to you that will last a lifetime. Chris says, Two of the biggest keys to eliminating barriers and mastering your mindset are to intentionally grow and to be constantly learning. These are things that I live and breathe on a daily basis. Because my mission is to be a river and not a reservoir, working together, you will benefit from my constant and never-ending thirst for knowledge by receiving the latest and greatest tips and techniques along with tried and true methods to enhance your abilities, eliminate barriers and to master your mind set. Here is what Carla Andrews, President, Signature Living, Inc. (www.signatureliving.com) said about Chris, Chris M. Sprague is an emerging thinker among the art and science of building successful businesses. He can help you discover the leadership principles needed to help you believe in your ability to reach your potential and goals. As Chris helps you to commit to your long term goals, he knows how to handle difficult and challenging situations and lead you to appreciate the journey as much as the destination. 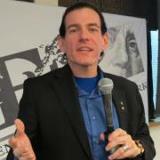 Chris M. Sprague is THE coach, speaker, and teacher for your personal and business needs.